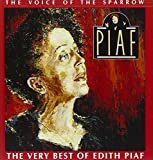 EdithPiaf.com is a tribute to Edith Piaf (1915-1963), one of France's most beloved singers, with much success shortly before and during World War II. This site features a music library, a bookstore, poster gallery, a film library, several links of interest and a shop. Edith Piaf was one of France's most beloved singers, with much success shortly before and during World War II. Her music reflected her tragic life, with her specialty being the poignant ballad presented with a heartbreaking voice. The most famous songs performed by Piaf were La Vie en Rose (1946), Milord (1959), and Non, Je Ne Regrette Rien (1960).